5 Bedroom Detached House For Sale in Derby for Asking Price £750,000. Outline planning for two, four bedroom detached house's. 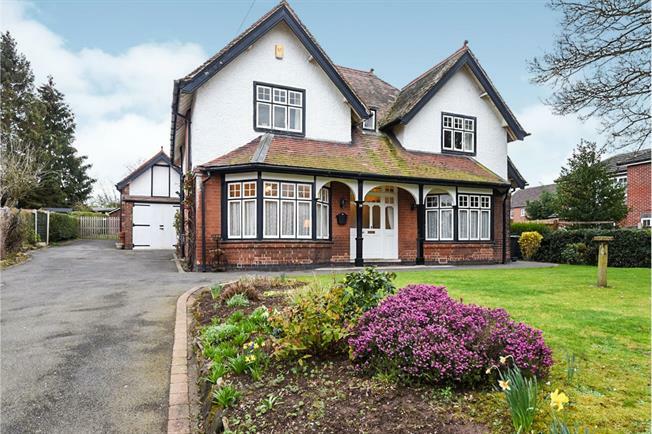 Having a wealth of character, this five bedroom detached property, with its large, spacious rooms, is the perfect family home. Sitting on such a large plot means that taking advantage of the planning permission, it would still leave a good size garden for the main residence. Internally you enter into a large and welcoming entrance hall with stairs in front of you and doors leading both left and right. On the right are two spacious receptions rooms. To the front is the lounge and to the rear is the family room. The other side of the hall boasts equally as spacious rooms which form the open plan kitchen and dining room. Also to the ground floor is a WC/utility room. Rising to the first floor there is a stunning window seat on the landing and five spacious bedrooms. There is also a family bathroom. Outside to the front is a driveway for multiple cars and a garden with lawn and established beds. To the rear is garage/coach house and a very large garden with the potential having it as a building plot. There is adequate space at the side of the property to create access should someone wish to take advantage of the planning permission. Viewing is strictly by appointment through Frank Innes Derby..
A spacious entrance with period, decorative archway and tiled flooring. Window overlooking the garden, tile floor, integrated oven and hob, space for dishwasher and fridge freezer, a combination of wall drawer and base units and is open to the dining room. Bay window to the front, window to the side, wooden floor and open to the kitchen. Bay window to the front, windows to the side and period, decorative arch fireplace. Windows over looking the garden and door to the garden. Wooden floor and window to the side. Window the front and radiator. A spacious landing with feature window overlooking the rear garden with window seat.